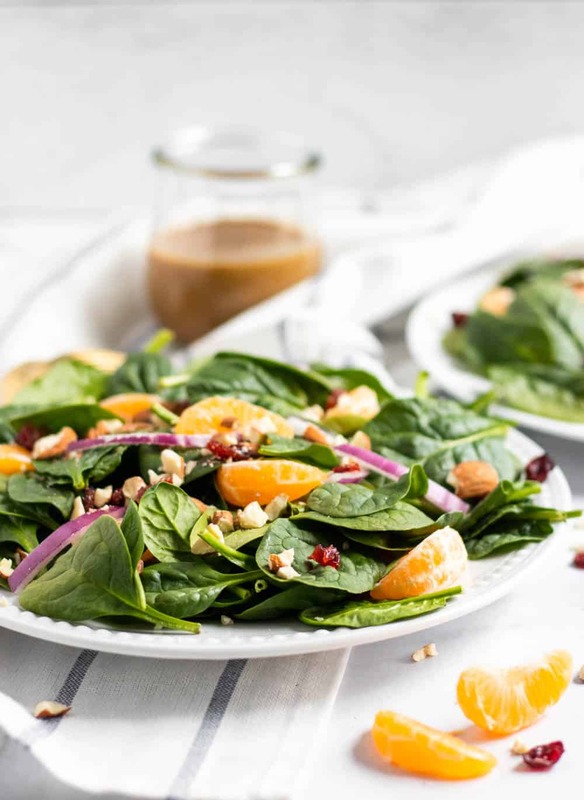 Fresh juicy mandarins make this Spinach Mandarin Salad a perfect way to brighten your day! 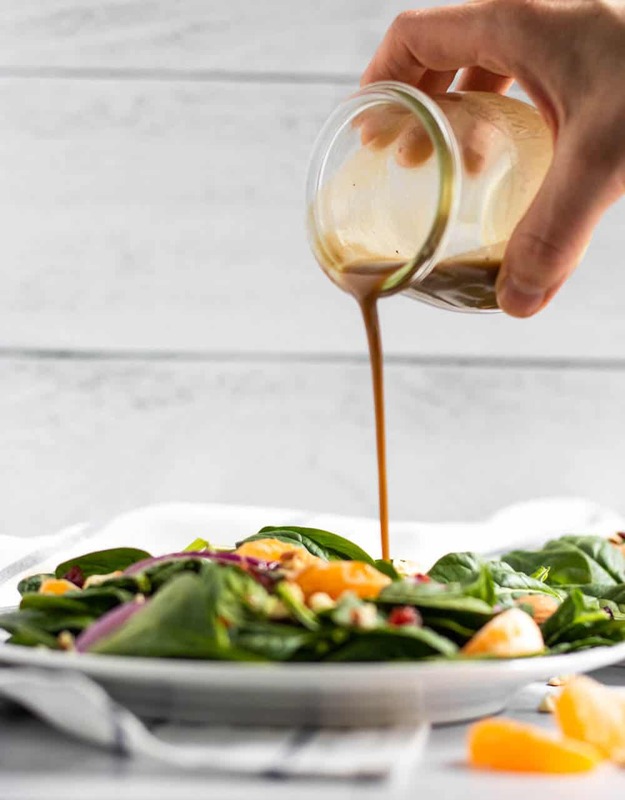 Toasted almonds, cranberries, a fresh honey balsamic dressing and more will make this the perfect go to salad for any dinner! Haven’t really craved much along the lines of a salad much this winter. But who can blame me? When there is so much soup and chili to sip, how could a salad be on the brain? The last salad recipe I even published on the blog was back in late August, this Blackberry Quinoa + Spinach Salad, and it was a good one. But since then my salad game has been pretty darn boring. Until now. Somehow I ended up with a massive amount of spinach and needed to use it up fast. Hmmmm, spinach isn’t quite the all you can eat kind of ingredient, but I certainly ate a whole lot of it. Popeye would be so proud. I had a smoothie or two–my favorite blueberry smoothie, in fact, and then tossed some into dinner recipes but still I found myself in a pile of spinach. What’s a girl to do??! Well, it’s winter, but it’s also citrus season. So a good old spinach salad with something bright and orange was the only answer I could think of! 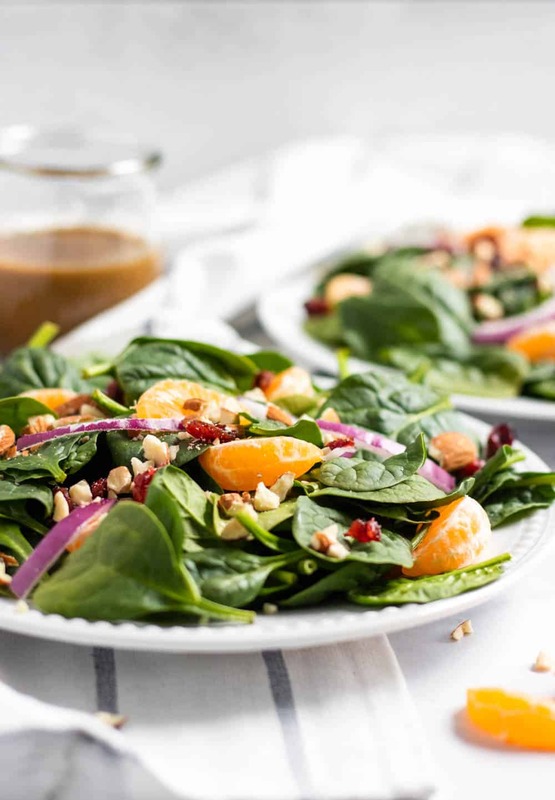 And thus, we have this Spinach Mandarin Salad! 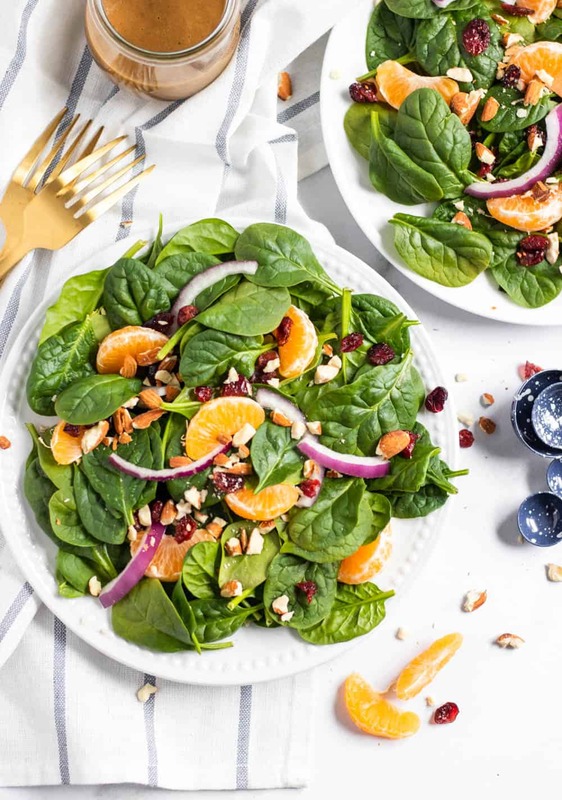 Fresh mandarins, cranberries, toasted almonds and a fresh balsamic dressing with a hint of honey make this salad a fresh way to get out of your salad rut. And boy oh boy, do I get into my fair share of ruts. 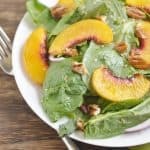 The thing I love about this salad is that I can have it as a side or I can toss on some chicken or salmon, maybe some goat cheese and then I have a meal! 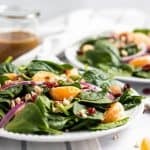 It’s a great base and the dressing for this spinach mandarin salad is another part of this recipe that can be a favorite go to. Simple and full of flavor. I won’t lie, I do a lot of store bought dressings, but when I make my own, I do think, gosh, I should make my own dressing way more often. I mean, it literally takes less than a minute or two to whip up. Yes, I know, it only takes about 10 seconds to grab a bottle from the fridge–I know, I do it all the time. Sometimes though, freshly made is just too good to pass up. It’s worth the extra effort–even if the effort is so minimal! No spinach? Can’t stand spinach? No worries, just sub in your favorite green! I promise the salad will still be super tasty with Romaine or a good spring mix. As I noted earlier–add in some cheese, some grilled chicken or fish and boom, dinner is served. Or lunch for that matter. This salad is a great base to turn into a full meal. And the possibilities are endless. I love to hear how you spice it up, so let me know! To toast or not to toast?? Toast! I mean, that’s what I prefer. You could easily just toss in some store bought roasted almonds, another way to shake it up. I love toasting up almonds just before I toss them in a salad. That’s it, now you are set! Enjoy! 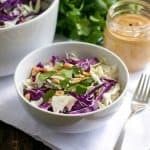 More salad recipes that I know you will love can also be found here! Combine all salad ingredients in a medium bowl. Place ingredients for dressing into a high powered blender and blend on high until smooth. If dressing is too thick, add a small amount of water to thin out. Add desired amount of dressing to salad and toss just before serving. Enjoy!